make a phone can not / person we can not listen to the voice telephone us, it means that the mic is on the phone Samsung G610F is broken, so it does not work to communicate. The solution of this problem is, you have to replace the mic with the new mic if there is a genuine / especially for you, but if you do not have a mic specially for Samsung SM-G610F, you can replace it with a Chinese phonemic / mic that no wires his. Samsung Galaxy J7 Prime smartphone was launched in September 2016. The phone comes with a 5.50-inch touchscreen display with a resolution of 1080 pixels by 1920 pixels at a PPI of 401 pixels per inch. Samsung Galaxy J7 Prime price in India starts from Rs. 14,990. The Samsung Galaxy J7 Prime is powered by 1.6GHz octa-core Exynos 7870 processor and it comes with 3GB of RAM. The phone packs 16GB of internal storage that can be expanded up to 256GB via a microSD card. As far as the cameras are concerned, the Samsung Galaxy J7 Prime packs a 13-megapixel primary camera on the rear and an 8-megapixel front shooter for selfies. The Samsung Galaxy J7 Prime runs Android 6.0 and is powered by a 3300mAh nonremovable battery. It measures 151.50 x 74.90 x 8.10 (height x width x thickness) and weigh 167.00 grams. The first step that should be done is to replace the charger plug or the charger connector, usually, damage to the pin or needle in the charger plug. If after replacing the plugin does not solve the problem. Try the next step. The second step checks charger lines as in the picture below if there is a path-breaking try to do the jumper. 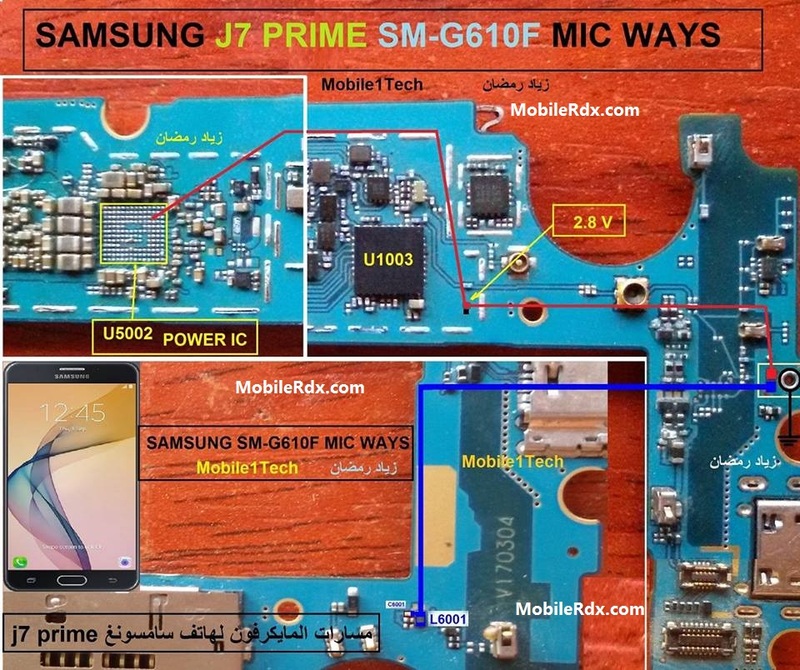 First, you have to remove the broken mic/problems that are still attached to the PCB Samsung Galaxy J7 Prime G610F, you could be separated using Blower / Solder, then you grab the mic china mobile phone and plug it directly to the Capacitor / Resistor Mic that we put a red color for line plus and black to track, please direct you to solder the capacitor/resistor do you plug in a mic directly as track plus a mic easily damaged/broken. Please note that although every diagram & solution posted on our website has been tested by one or more members of our team before posting, so we will not be responsible for any loss or damage, including personal injury.Use this repair solution at your own risk.